Once I had the idea for a book, I spent some time considering what publisher to approach. 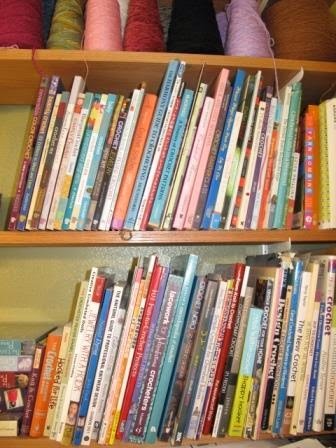 I started by looking at who published the books on my own book shelf. 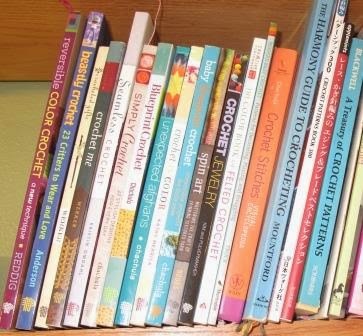 Then I spent time examining the spines of crochet books at several craft stores and book stores. I found I was consistently drawn to the look and design of the Interweave books (and I own more from them than any other). I made a list of publishers I liked most and looked for book submission information on their websites. There is a lot of great information out there, and many publishers are very specific about how they would like a book proposal presented. One thing that is a little different about Interweave's Book Submission Guidelines is that they encourage submitting even if you just have an idea for a book. If they like the idea, they will actually help you develop it into a full proposal. As my first time submitting to a publisher, this idea really appealed to me. In the summer of 2012, I had just finished my first designs and an article on Reversible Intarsia for Interweave Crochet Magazine. The editor, Marcy Smith, happened to be one of the judges of the CGOA Design Competition when my Mystery Machine won and remembered my work and technique when I submitted to the magazine.